There is an amazing amount of gorgeous doll clothes also. Have fun and I hope YOU win! How would you like to win an American Girl Doll and a huge collection of custom made clothing & accessories? Would you love to have this for your daughter, granddaughter or maybe yourself? You could win it just in time for the holidays! 1. Diana of Diana Rambles - Diana aka FreeStyleMama, self-described creative crafty mama of 3 who blogs about food, crafts, family & fun. 2. Amy of SewsNBows - Amy is a fabric hoarder and sewing pattern collector who enjoys sewing children's clothing and accessories. Her creations are showcased on her blog. 3. Barbara of Barbara's Beat - Since April of 2009, Barbara's Beat has been blogging about family issues; helping moms find deals; find coupons and resources to save money and make life easier; win giveaways; and learn about consumer issues. We also promote MOMtrepreneurs and DADtrepreneurs. 4. Jenny of Learning and Growing the Piwi Way - Jenny, a proud wife and mama of two girls. The family travel with her hubby’s work so most of her time is spent teaching her kids and passing on a love of cooking and crafting. In her spare time, JJ blogs about their portable learning. You can read about their travels on her blog. 5. Gina of Gina's Craft Corner - This blog follows Gina on her journey as she learns to sew. She mainly focuses on turning upcycled material into something beautiful. 6. Shannon of Cozy Country Living - Shannon is a wife and stay at home mother to four wonderful children. She enjoys living in the country with her family and shares her simple recipes, crafts and family fun ideas at Cozy Country Living. 7. Janell of Saving you Dinero - Janell is a stay-at-home mom and blogger at Saving You Dinero, a blog dedicated to "saving you time and money, from kitchen to store and so much more." Janell enjoys baking, shopping online, and saving money by scouring the internet for the best deals and coupon codes. 8. Millie & Kristina of 2 Crochet Hooks - Millie and Kristina, a Mother and Daughter team of Fiber Crafters, Entrepreneurs and Environmentally Concerned Parents. Blogging about Crochet, Crafts, Recycling, and Fun! 9. 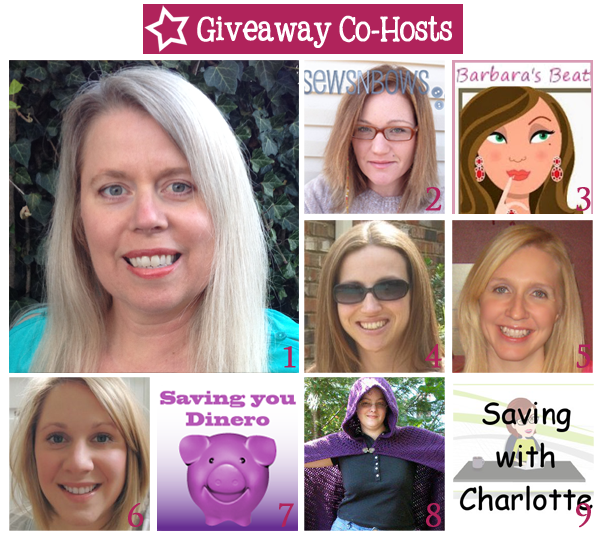 Charlotte of Saving with Charlotte - Charlotte created Saving with Charlotte to share her love of couponing and frugal living with others. She blogs about Kids Crafts & Indoor Activities, Simple Household Solutions, Freebies, Miscellaneous Offers, Meijer Deals and more! Enter the giveaway using the PromoSimple entry form below. US Only. Official Rules at bottom of PromoSimple entry form. Bonus entries unlocked after required entry. The more entries, the better chance you have of winning. Thanks for this chance to win one of your precious dolls for my only granddaughter.